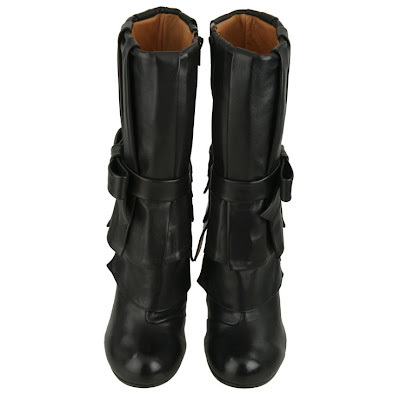 ... the Saigon boots by Chie Mihara. I tried them on in a local store. 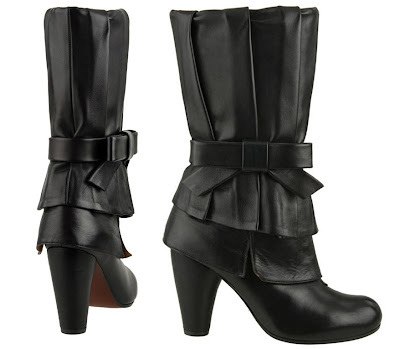 They are cute, edgy, flattering, easy to wear, unbelievably comfortable, SIMPLY AMAZING. And 40% off. But still really, really expensive. However, that local shop's price actually beats Revolve Clothing's price of $351 or 266 euros for their last pair of Saigon boots in brown. Which means I won't be finding a better price on the internet. And you can trust me on that, I google "chie mihara" more often than I brush my teeth. I could try searching the shops in Athens next week when I'll be there, but is just the mere hope of an extra 10% off worth the risk of coming back to Volos and finding them gone? *if they are not 100% comfortable though, forget about them. better print a picture and put it on ur wall, for the sake of ur precious feet (& shopping budget)! p.s. so how much are they? Alecca, they are so comfortable that when I left the store I was thinking I could wear them every morning for the rest of my life! They are down to 258, original price 430. I would never buy them at their original price, as perfect as they may be, 430 is an absurd amount of money for a pair of boots, at least for a student like me. But they are perfect and 258 for such quality, comfort and beauty is almost justifiable. You know what I'm going to say, don't you? ;) I have one pair of Chie Miharas and I still love them unconditionally, two years later. They are the shoes I get the most compliments on, they are the most comfortable heels I own, they are crafted beautifully, and they are a joy to wear. They cost a bunch but I have never, ever regretted the purchase. I vote yes, and I hope to see these gorgeous boots in pictures often should you choose to go for it. these are absolutely beautiful and stunning. I think perhaps worth the investment? Although I have a hard time saying no to shoe greatness. Ha-ha, this is the hard part of buying process! Good luck on your decision. go buy! they're worth it. :) then i'll drool over when you have them. 258 is not bad at all. i mean we go and buy all those cheapy-cheapos that torture our feet just to be able to buy more than one pair. what's the point? I say buy them if you don't have any other similar pair of shoes/boots. and if they fit with at least 50% of the rest of your closet. I wonder which love is greater: Yours for Chie Mihara, or mine for John Fluevog. I am never one to nay-say a shoe purchase, and these do, indeed, look like they'll get worn to pieces. They're stylish, but not too quirky, well-made, and perfect for you. If you've got the money and other aspects of your life won't suffer from you spending it, GO FOR IT! I say buy them! Amazing. get 'em now! they're awesome! if I had the money I would buy them! I've done that before.. going to see another shop and it was pricier and then the other was gone, but the opposite too. and then it's a lot of money, but well spent! it's a good investment.